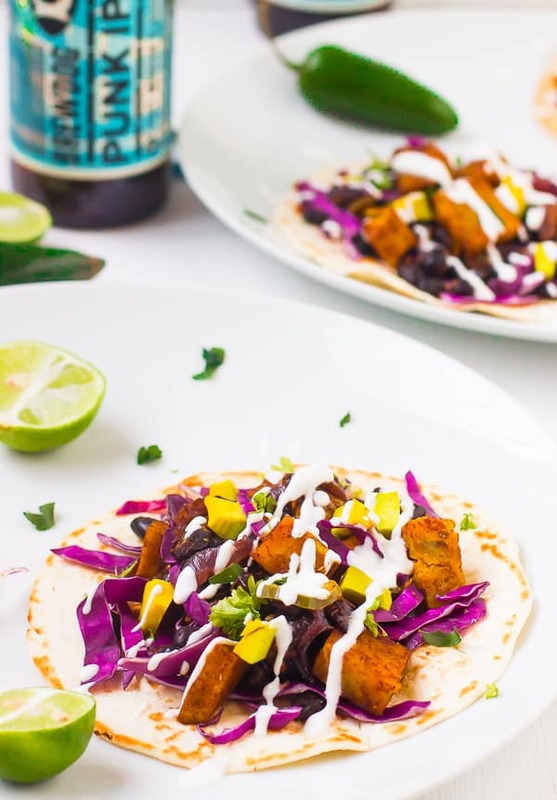 These Sweet Potato and Black Bean Tacos are amazing homemade vegetarian tacos. 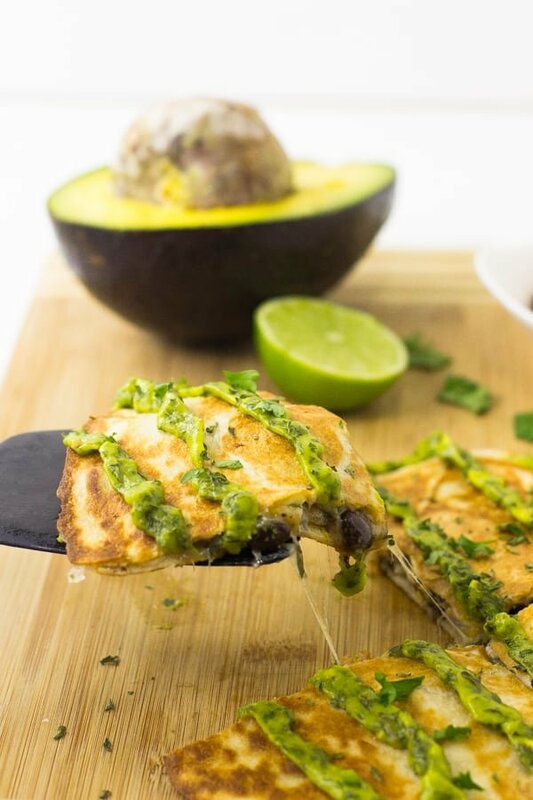 They are drizzled with a delicious creamy Lime Crema! Happy March! I’m definitely ready for some fresh spring recipes, and (best part) super early prep for Cinco de Mayo! 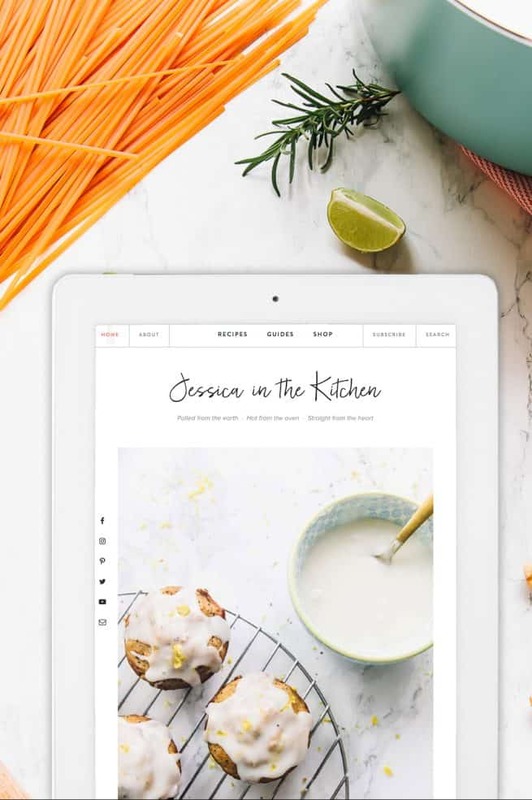 I tend to eat Mexican recipes all year round so I’m pretty sure by the actual celebration I’ll have quite a lot of recipes to share with you. That’s always good news, isn’t it? 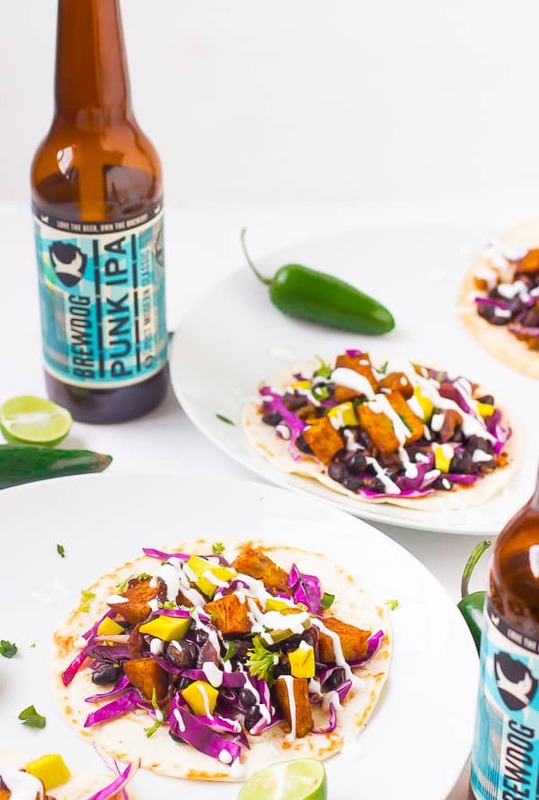 So let’s get right to these amazing vegetarian tacos. Let the pre-celebrations begin! Sweet potatoes and black beans are a definite staple in my household. My husband and I usually don’t buy irish potatoes, and he loves sweet potatoes even more than I do, so we put them in just about everything. 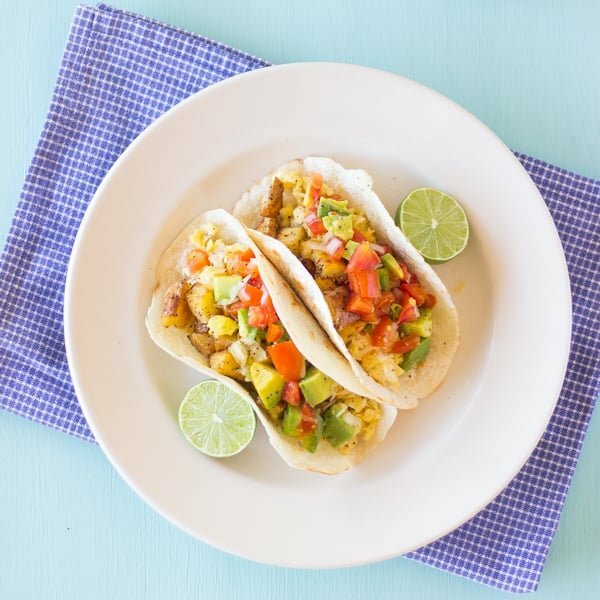 I’ve been craving making tacos for weeks now, and I knew immediately that not only would it of course be vegetarian, but it had to have fresh and in season ingredients that would come together super easy. That’s what I love about tacos. They can have such a variety of ingredients and always. Taste. AMAZING. These tacos were a no brainer and came together perfectly. I’ve made them quite a few times now. The sweet potatoes and red onions are cooked until the sweet potatoes are crispy on the outside and the onions are semi caramelised, and then all the delectable seasonings are added to the mix. Truthfully, I would mix this in with quinoa and add the lime crema and this would make a perfect dish. But of course, tacos. 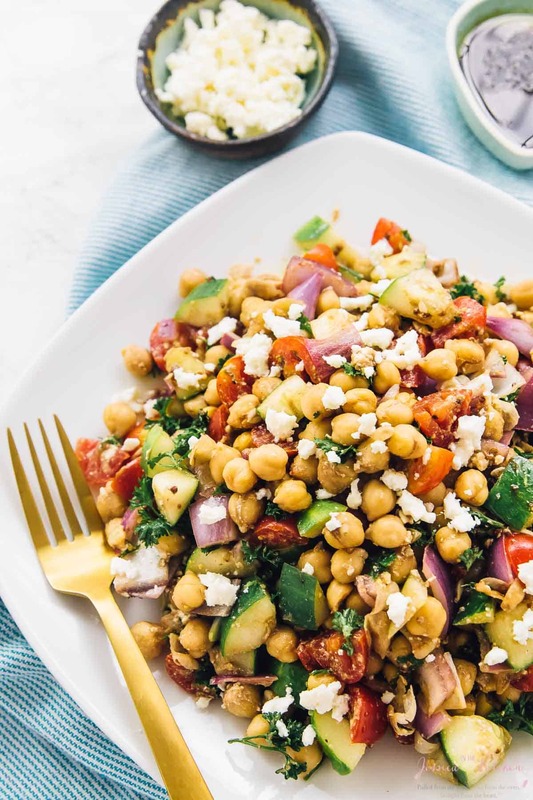 The fresh veggies make a world of a difference to not only filling these up with beautiful colours, but also by adding a nice spring-like freshness for a crunchy, creamy, tangy, spicy and sweet combination. The lime crema on top is definitely the icing on top, figuratively speaking of course. Unless you actually want icing. Treat yo self. 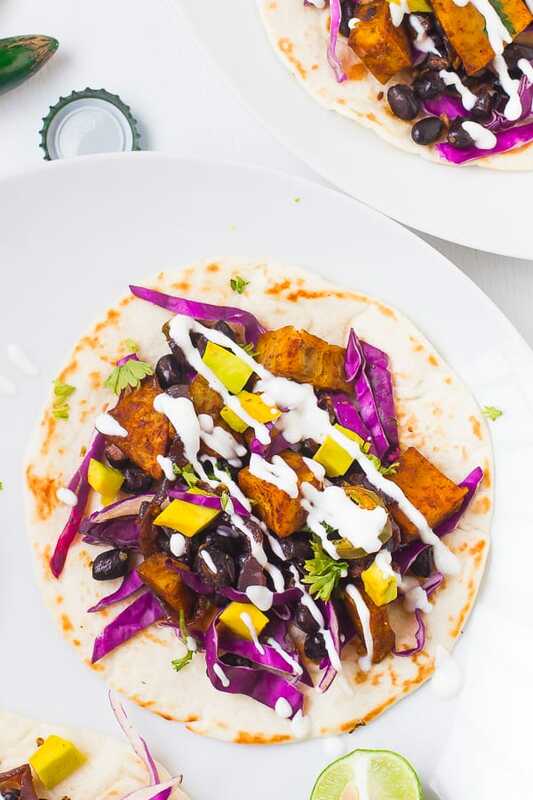 If you give these Sweet Potato and Black Bean Tacos a try, please let me know in the comment section below, or tag me on instagram with the hashtag #jessicainthekitchen! Taco Nutrition Facts is without the taco shells. In a bowl, mix all the ingredients together. Add a tablespoon or two of water to thin out the lime crema for drizzling if you so desire. Season with salt and pepper to taste. Place in a squeeze bottle and in the fridge until ready. In a skillet over medium heat, heat the coconut oil. Add the onion and sweet potatoes in the oil and coat. Sprinkle the ground black pepper and sea salt over the mixture to combine. Add the water. Cover the pot and cook until potatoes are crispy on the outside but cooked through on the inside, about 8 minutes, stirring often so that the onions don't burn. Add the garlic, cumin, chili powder, oregano and crushed coriander seeds and stir to combine with the sweet potato and onions. Add the black beans. Lower heat to medium and cook for about 3-5 minutes. Stir once more. Add salt and pepper to taste if necessary. Layer a 1/4 of cabbage, sweet potato mixture, avocados, jalapeños and cilantro over the soft taco shells. Drizzle the taco shells with the lime crema. To make this vegan, you can use vegan greek yogurt or make a [url:1]cashew crema. 2. To make this gluten free, ensure you use gluten free soft taco shells. 3. You can store the sweet potato and black bean mixture in a tupperware container by itself. Heat the taco shells when you’re ready to serve, and cut the toppings fresh also. You can also store the lime crema in the fridge covered. Reheat the sweet potato mixture in the microwave. 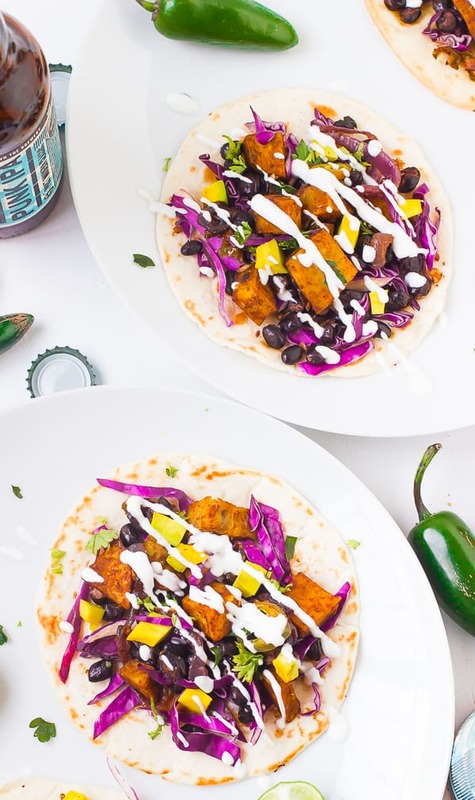 These Sweet Potato and Black Bean Tacos are amazing homemade vegetarian tacos. They are drizzled with an amazing Lime Crema! We are taco obsessed in our house, so I am loving these. They could easily be made vegan too! Yes! Thanks Dannii! We need to start a taco day at my house! Can today be Taco Wednesday?? Because I’m seriously flipping out over how amazing these tacos look right now! That lime crema sounds AMAZING! Love that idea Sarah haha! Thank you! Oh yes! We make these really good sweet potato and black bean tostadas and they are our fave! These tacos look great! Thanks Annie! Those tostadas sound great! Sweet potatoes and black beans are one of my very favorite combos! These tacos sound delicious – especially with that lime crema! I love how colourful these tacos are!! I’m a huge fan of sweet potatoes too- I’d definitely love these! YUM! These look amazing. SO beautiful. Honesty, this recipe is perfect for me because I love sweet potatoes and I love tacos! …what a great way to enjoy my faves in one meal! Thanks for sharing girl. Just made the sweet potato and black bean tacos and my 17 year old as well as my mom liked them. The former is the harder crowd to please but my mother likes a lot of flavor, and both were happy. Me too. One thing: my store did not have sweet potatoes chopped up, only butternut squash so I used them instead. But the flavor all blended well together and the cabbage provided a nice crunch. The crema was good since I love anything with lime or lemon to lighten things up. I kinda wish the crema could have an even richer taste but these tacos were tasty and flavorful. 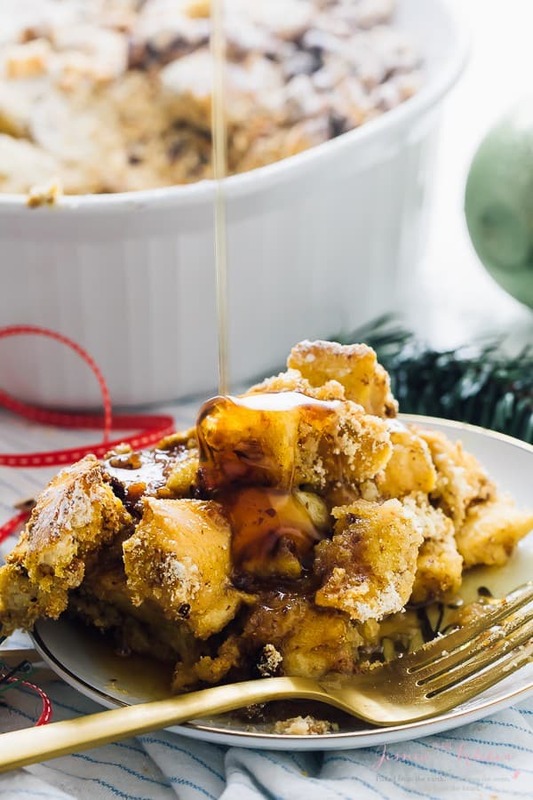 A definite new go to recipe as very easy to make. Thanks Jessica for all your hard work in making meals easy for us!